Get students to round on a number line! It’s the best way to teach third grade students how to round to the nearest 10 and 100. Why? Because it builds conceptual understanding of the relationships between numbers. This animated PowerPoint supports the Common Core State Standards for Math for rounding in third grade. Use it also as a review with fourth graders before rounding greater numbers. The animated PowerPoint with sound contains 3 lessons and is divided into five parts. 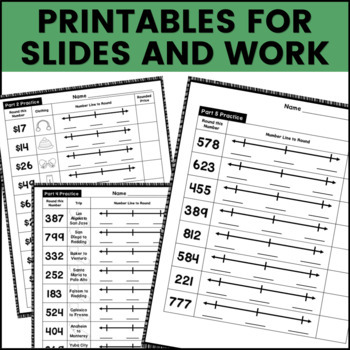 Each lesson includes a practice printable that goes along with one of the PowerPoint Parts. There are also support materials and ideas for supporting English Language Learners (ELLs) and Students with Disabilities (SWDs). Using a real life experience about shopping, students are guided through a scenario on how to round to the nearest ten. Students are shown through animation how to use the number line to round each number to the nearest 10. In this section, students can practice rounding to the nearest 10 with a printable that has 10 practice problems. Using another real life example of traveling on a road trip, students are guided through a scenario of how to round to the nearest hundred. Students are shown through animation how to use the number line to round each number to the nearest 100. 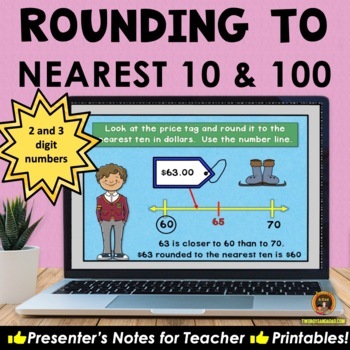 In this section, students can practice rounding to the nearest 100 with a printable that has 10 practice problems. In this lesson, students are guided through a real life scenario on how to round a 3 digit number to the nearest 10. Students are shown through animation how to use the number line to round each number to the nearest 10. Students also have a printable to practice the 7 example problems presented in the PowerPoint. 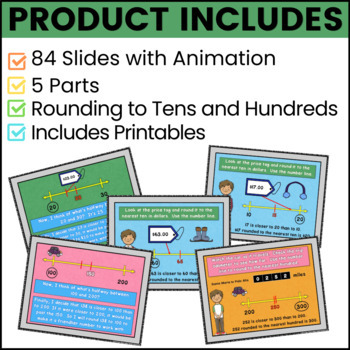 Presenter’s Notes PDF with detailed instructions on how to use each slide to advance animations. The Presenter’s Notes also include questions that the teacher can ask to stimulate mathematical thinking. Teacher Notes explaining how to use each component. 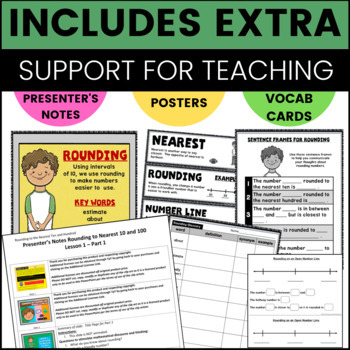 Rounding Posters that can be hung in the classroom as a resource. Both color and black and white versions included. Rounding Vocabulary Cards to help support all students, but especially ELLs and SWDs. Each cards has a kid-friendly definition with synonyms and a visual representation. Frayer Model template for rounding to help students solidify their understanding of the concept of rounding and for ELL and SWD support. Student Glossary that students can fill out with their own definitions or yours for all the vocabulary words as a support for ELLs and SWDs. Bookmark that can be taken home or used as a study guide or resource. Sentence frames to support all students but especially ELLs and SWDs. They help students use the correct academic math vocabulary. Number Line Template that can be inserted in a plastic sheet protector for students to practice rounding. Rounding Challenge Sheet that contains 10 questions and DOK levels 2 and 3. Answer Keys to some of the printables. Please note that the PowerPoint is NOT editable. The file contains one PowerPoint and 2 PDF files (Printables and Presenter’s Notes). Be sure to click on the green ★ to follow me for updates and new product announcements! Do you need some fresh ideas and tips? Then be sure to visit my My Blog. Each time you give feedback, TPT gives you feedback credits that you use to lower the cost of your future purchases. I value your feedback greatly! If you have any questions or concerns, go ahead and contact me through the Q & A and I’ll get back to you ASAP!